Excellent Hultafors knives, bundled together to save you money. You get the heavy duty GK, the Hi carbon HVK and the Stainless RFR all at equivilent of just $15.33 ea. 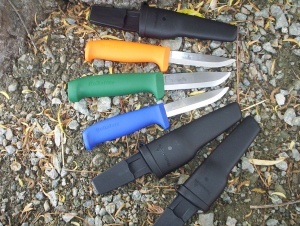 Superb knives, useful in a variety of situations, 3/4 tangs, very high quality steels, to 58-60HRC. Purchase through PayPal by using the "Add To Cart" button above or use the form below to order the Hultafors Pack . Feel free to contact us if you have any questions about the Hultafors Pack .